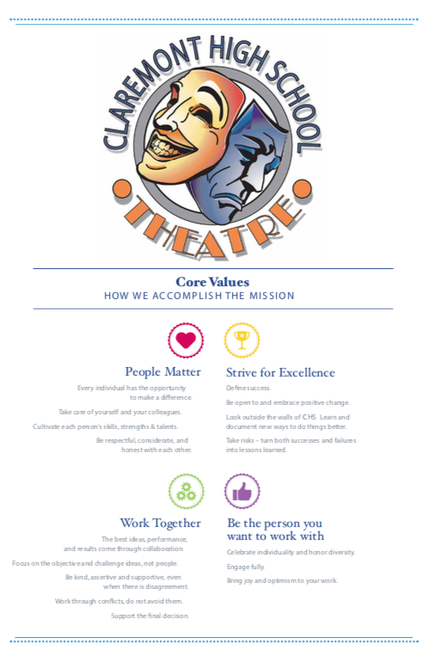 ​Claremont High School Theatre is a nationally-acclaimed theatre department. We have over 500 students involved, many of whom are also inducted Thespians who compete at state, national, and international levels. Our students work in both the art of performing and technical theatre. We are ranked in the top 1% of theatre departments in California, and we are among the top public high school theatre departments in the nation. CHS puts on 6-8 shows a year, including plays, musicals, showcases, one-acts, and ComedySportz High School League matches. Join us in celebrating our 56th season! Please explore our website to learn more about the department! To see what shows are coming up, click "2018-2019 Season". ​good ​luck on opening night. Click below to watch her message to CHS Theatre student performers! STUDENTS: Check the callboard in the CHS Theatre or contact an officer for the password to the callboard section of this website. In that section, you can find handbooks for most of the classes, class lists for Musical Theatre, Theatre Production, and Children's Theatre, the current date sheet, and the Thespian contact sheet. Thespian meetings are on Tuesdays at lunch on main stage in the CHS theatre. Enter through the loading dock, and eat during the meeting. All Claremont High School students are welcome!